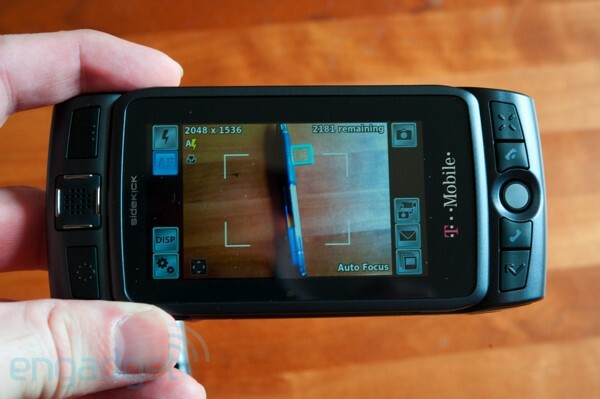 T-Mobile's Sidekicks have been cult favorites stretching all the way back to the original grayscale model -- a device with a design only a mother could love, may we add -- when it launched nearly seven years ago. Though the unusual form factor with the addictive spring-loaded pivoting swivel has largely prevented it from attracting a mainstream audience, the countless teens and twenty-somethings who've latched on to the Hiptop ecosystem have cited many of the same reasons for loving it since day one: an easy, foolproof UI, push email, high-quality customizability, decent web browsing capabilities, and a stellar messaging-optimized layout (remember that QWERTY was little more than a twinkle in most manufacturers' eyes back in 2002). 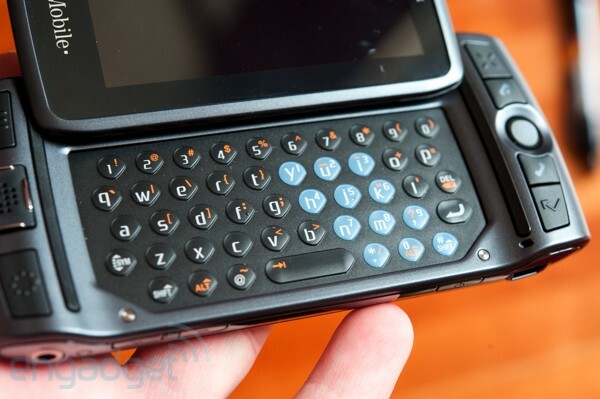 At its launch, the first-generation Sidekick LX represented a new high end for the franchise -- big shoes to fill for the 2009 model of the same name. Does it live up to the hype? More importantly, could this be the first Sidekick complete enough and robust enough to reach new audiences? Read on. From a distance, the new LX might look like any Sidekick, especially the late-model LX and last year's Sidekick 2008; hands-on, though, it becomes a very, very different story. This is the first Sidekick we've used that feels like a genuinely high-end device, thanks in large part to a soft-touch coating with a tasteful, subdued metallic finish (we've seen both the Carbon and Orchid models, and those comments apply equally to both colors) and tasteful chrome accents on the top, bottom, and d-pad. In a way, this aspirational look could backfire -- Sidekick users tend to be young, independent, expressive individuals, and with the loss of the 2008's totally removable shell, that expression's currently limited to choosing between two dark, nondescript shades. 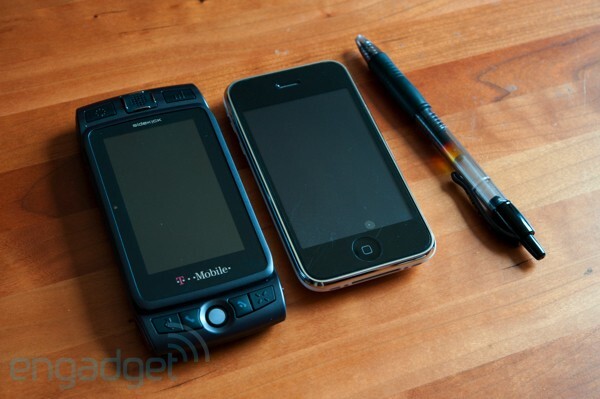 Then again, T-Mobile raises an excellent point: the original batch of Sidekick users is all grow'd up now, they're in the workforce, and they need a device that looks as professional as they are -- and a device like this is an excellent opportunity to keep them in the fold rather than lose them to, say, a BlackBerry. Sidekick users of all types will feel right at home with the LX's controls. Most importantly, the Menu, Jump, Cancel, and Done buttons are right where we all expect them to be, as are the d-pad and trackball. If we had our druthers, we wouldn't mind seeing the Send and End buttons swapped with the Cancel and Done buttons -- feels more logical, for some reason -- but we understand that that'd be blasphemy as Sidekicks go, and there's really nothing wrong with the current layout. All of the controls have great feel and tactile response, and because the LX is so large (more on that momentarily), there's very little risk of hitting the wrong one. There's a lot of attention to detail here, actually: the chrome accents on the d-pad that we mentioned before double as raised edges that help you "feel out" the four directions, for example. Moving around to the bottom edge, you've got your 3.5mm headphone jack, volume controls, power button, and standard mini-USB jack for charging. 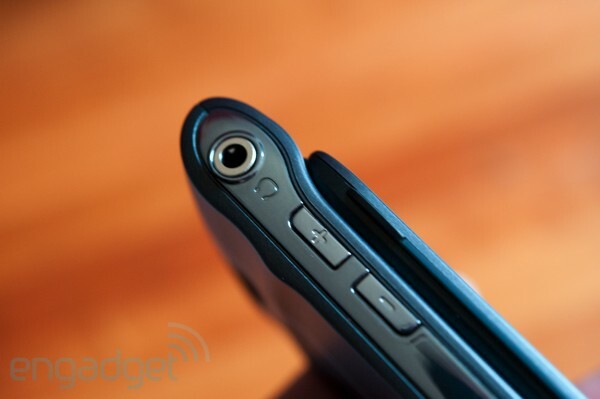 The volume controls are flush with the phone, which can makes quickly raising and lowering volume tricky (during a call, for example) -- it would've helped if they'd slightly angled the two buttons in opposite directions. The selection of mini-USB over micro-USB is a little surprising for a device launched these days, but let's be honest -- everyone has a mini-USB cable laying around, so we're certainly not complaining (if this phone were launching in 2010, maybe, but not today). At least it's a standard connector, which always earns points in our book. The jack can present a problem for some users, though; jacks mounted on the long side of a phone are always tricker to use in practice than those mounted on the short side, simply because it makes the package unwieldy in a pocket -- especially if you don't have the benefit of an L-shaped plug on your headphones. 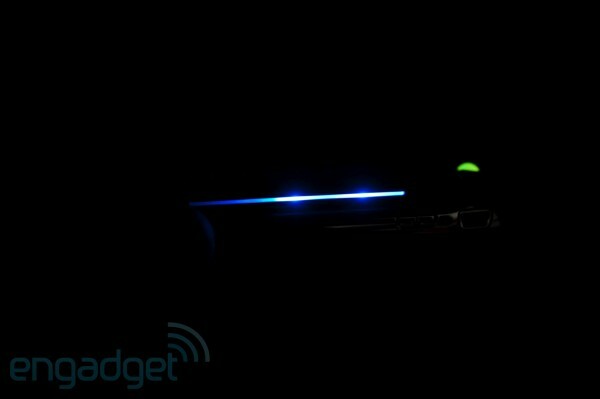 On the top edge, you find the two shoulder buttons as you'd expect of any proper Sidekick. The right shoulder doubles as a camera shortcut key and shutter button, which means it has two detents -- the left only has one -- which can be a little annoying at times. Throughout the LX's interface, you find places where you can use the right shoulder to move through dialogs, but the two-detent press is disconcerting enough so that we found ourselves preferring to highlight and click with the trackball. This is another case where we understand exactly why Sharp had to do it this way -- users expect the camera shutter button in the upper right, and they did the best they could. The button gets a little harder to press with the screen open, so pics and videos are best captured with the phone in the upright and locked position. They keyboard is interesting, because it's essentially nothing more than a membrane with raised dimples for keys, but it somehow works extraordinarily well. Feel is great, we didn't mistype even once, and we were pretty quick with it right away (and we imagine you'd be flying after a week or two). If we had any complaints, it'd be that you have to press a little too hard and the space key didn't have quite enough tactile response to it, but we're reaching there -- it's seriously a stellar setup. As we alluded to before, this is a big phone. We hate comparing it to an iPhone, since it has absolutely nothing to do with an iPhone and the average Sidekick buyer probably isn't cross-shopping it with one -- but since the iPhone 3G's a pretty ubiquitous object, we pulled it out to give a common sense of scale here. Don't get us wrong, by no means is the LX frustratingly large; quite the contrary, actually -- it's big enough to make the keyboard expansive and comfortable, the device itself won't feel miniaturized for users with larger hands, and it still easily fits into a pants or jacket pocket. Any larger, though, and we'd start to get into dangerous territory. Turning the phone on, you're treated to a fireworks display as the screen's light bar goes crazy. In addition to the multicolor trackball light, a bright three-LED light bar on the edge below the screen can be configured to alert you to new emails, IMs, and the like, and it's hard to miss. Add in the trackball, a piercingly-loud speaker, and perhaps the most violent vibrating alert we've ever experienced, and you're extremely unlikely to miss an important message or call (and if you do, you probably need your pulse checked). Never mind the light bar, though -- let's turn our attention to that screen, that fabulous, mind-numbingly awesome screen. At a crisp, vivid 854 x 480, this is definitely one of the best displays to ever appear on a US-launched handset, competing up in rarified air with the likes of the Sony Ericsson X1. The viewing angle is essentially 90 degrees in any direction, and this might be the first device we've ever used where we're physically unable to pick out individual pixels without the aid of a magnifying glass -- it's just that sharp. By and large, your ability to maximize the usefulness of such an insanely high resolution on a 3.2-inch display is limited by the youthfulness of your eyesight more than anything else, and thusly, most of the phone's user interface is merely crisper -- not smaller and more densely packed than its predecessors. Web browsing benefits the most, which we'll get to shortly. Like the Sidekick LX itself, the user interface will be totally familiar for upgraders; the classic rotating wheel of icons is present on the left with detailed app descriptions and glanceable views displayed on the right. As with every other Sidekick in recent memory, moving from icon to icon is an animated operation, and we kinda wish it wasn't -- sometimes we just want to move between items without any hoopla, but the animations take non-zero time to transition. Not a dream killer, but for the particularly impatient among us, it can be an annoyance at times. The 3.2 megapixel camera works reasonably well, with sub-half-second shutter lag and strong, relatively quick autofocusing capabilities. The macro mode worked really well for us every time we tested it, and the LED flash works about as well as you can expect an LED flash to work. Exposure and white balance can be adjusted on the fly, and thanks to the LX's newfound AGPS capabilities, photos can be geotagged (the feature is turned off by default). Besides cabling up to a PC, you have all sorts of options for getting shots off your phone -- email, Facebook upload, MMS, and Bluetooth are all available right from within the viewfinder UI. Unfortunately, we were less stoked about the video recorder; at 320 x 240 in "high quality" mode, it's nothing to write home about, and it's not even capable of replacing a Flip or the like for basic shooting duty. We'd say the occasional MMS or OMG-I-just-saw-a-UFO kind of moment hurriedly posted to YouTube is about as far as you want to take it. Twitter integration is quickly become a must-have feature for any smartphone or well-connected feature phone, and we're delighted to see that the LX's is top-notch. You can set the device to stay logged in and check for new tweets as frequently as every 5 minutes, displaying latest updates on the home screen and alerting you pretty much any audiovisual way you want. You can follow, unfollow, see profiles, view users' timelines, and pretty much anything else you can do from the full Twitter site, which vaults the phone at or near the head of the pack in offering a top-notch mobile Twitter experience. It froze up on us a couple times, but we're hoping this'll work itself out with an OTA update before too long. As we said, the browser's a particularly great place to take advantage of wide VGA resolution, and fortunately, it does a commendable job of rendering some pretty complicated stuff we threw at it -- engadget.com, as a purely random example off the tops of our heads. Though a "screen-size layout" mode is available to squish everything within the horizontal bounds of the display, we preferred the full-size mode that kept rendering and navigating more true to sites' intentions. Navigating can be tricky with the trackball -- even when you're flinging it with maximum velocity, it doesn't move the cursor with quite the speed we'd like unless you have the speed / acceleration turned way up -- but fortunately, the "mini page" menu item can bail you out by pulling up a thumbnail that allows you to thumb across a page much more quickly. 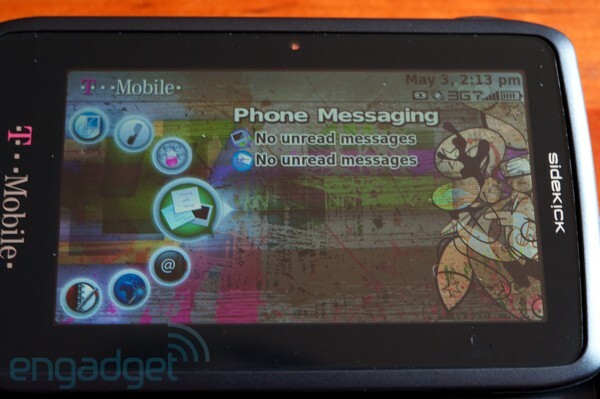 Considering that they've got to make do without a touchscreen interface here, this is about as good as it gets. Page requests took a while at times, despite the fact that we were always connected to 3G; we're chalking this up in part to the fact that everything moves through Danger's servers, but it'd be nice if they could tweak that to get it a little snappier. Perhaps above everything else, the addition of AGPS in the new LX is a big deal. 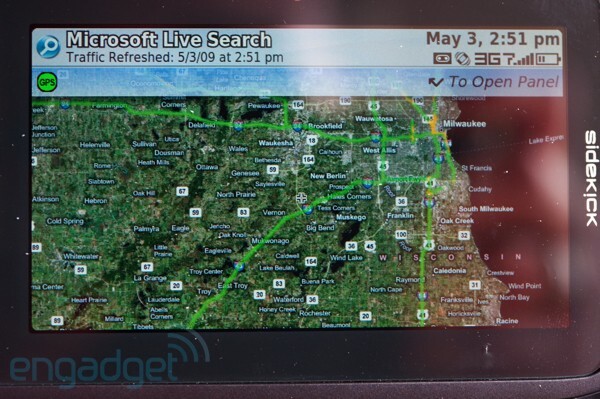 We would've expected location-based apps to be more pervasive throughout the phone's interface, but other than the camera's geotagging capability, the biggest GPS app of 'em all -- Microsoft Live Search -- isn't even on the main menu. Instead, they've elected to bury it in your Applications menu with the rest of the riff raff, which really isn't doing it justice. On 3G, maps loaded quickly -- and as you might be able to guess, they look stellar on this display. You won't be doing in-car turn-by-turn with it, but the Sidekick's design doesn't lend itself to that type of navigation anyhow, so we're not too worried about it -- think of it more as a way to find the occasional eatery or gas station and route to it with a visual list directions, just as you would on an iPhone. Unfortunately, there doesn't appear to be a dedicated pedestrian mode here, which is where this type of nav capability might be the most convenient, but we imagine there's opportunity for additional apps and future Live Search releases to fill in the gap there. We had trouble getting the gas prices feature to work, but both movie times and traffic worked flawlessly and very quickly (again, we tested exclusively on 3G -- using all this action in an EDGE market might be a smidge more painful). Historically, it's always seemed like the Sidekick range is one or two major features short of being a serious contender outside of the typical Sidekick clique, and for the first time, the LX 2009 seriously bucks that trend in a big way. GPS and 3G are critical additions that seem to work pretty well here, and we're stoked to see what sorts of apps end up filtering into the download catalog. Add to that the promise of Exchange integration coming soon, and we're pretty confident that the recovering skater punks out there working million-dollar deals in Armani suits (read: us, except for the Armani and million-dollar deal parts) could get away with pocketing one of these day and night. Over the course of the last couple generations, the Sidekick's gone from a quirky phone to a great phone -- and the metamorphosis may finally be complete.